For more than 30 years, UPMC Transplantation Services has defined the field of transplantation. 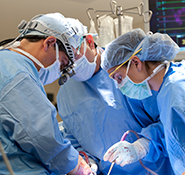 Since 1981, we have performed more than 17,500 organ transplants. Our role as a pioneer in solid organ transplantation has allowed us to develop some of the most extensive clinical expertise in the field, giving hope to patients across the country and around the world.